The heart is more than just a muscle. Imagine the heart as a house with four rooms. Each “room” (heart chamber) has a valve with flaps that open and close to let blood pass through. A valve opens and closes one time per heartbeat. Valves control the flow of blood and keep it moving in the right direction. Healthy valves open and close fully. With heart valve disease, the valves don’t function as well. 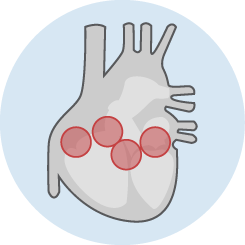 Heart valve disease can affect any of the four heart valves. Some unpreventable conditions can result in heart valve disease, such as autoimmune, metabolic or connective tissue disorders. In congenital heart valve disease, a person is born with faulty heart valves. Many people have heart valve defects but don’t experience any symptoms and are never affected by the disease. For others, the disease may gradually get worse and symptoms develop. The Valve Clinic at the Seton Heart Institute offers a multidisciplinary approach to valve procedures and allows patients an opportunity to discuss their other options, such as open sternotomy and aortic valve commissurotomy, with the surgeons. Because patients often have associated problems that require multiple specialists to provide complete care, Seton Heart Institute offers comprehensive case reviews by the entire range of specialties. Additionally, all procedures are performed at Ascension Seton Medical Center Austin for the convenience of our patients and their families. To learn more, please contact Norma Richtsmeier, Valve Clinic Coordinator, at 512-324-9999, Ext. 18156. Heart valve disease can be congenital, meaning the valves developed incorrectly before birth. In this case, there’s no way to fully prevent heart valve disease. Other types of heart valve disease happen over a person’s lifetime. Sometimes the cause of heart valve disease is unknown. For acquired valve disease, problems occur with valves that were once normal. This condition may be caused by changes in the structure of the valve due to a variety of diseases or infections, including rheumatic fever or inflammation of the inner heart layer (endocarditis). Strep throat can damage heart valves if left untreated. Taking antibiotics will clear the infection and prevent risk. Educating yourself about heart health and participating in preventative screenings are both important for prevention. Less common causes of valve disease include tumors, some types of drugs and radiation. Specific lifestyle factors can help maintain heart health, and may prevent heart valve disease from developing or worsening. A healthy, low-cholesterol diet, regular physical activity and abstaining from smoking are all important steps to take for heart health. Symptoms of heart valve disease do not always indicate the seriousness of a patient’s condition. In some cases, severe heart valve disease requiring prompt treatment presents no symptoms at all. In other cases, such as with mitral valve prolapse, there may be noticeable symptoms, yet tests only indicate an insignificant leak. Chest X-ray: Heart valve disease can change the heart’s shape or may appear as calcium deposits on the valves. A chest X-ray can show these changes. CT Scan: Creates a cross-sectional or three-dimensional image of the heart. This test helps a doctor closely examine valve anatomy. Stress Test: Determines how well your heart functions while you walk on a treadmill or after taking medication to increase your heart rate. Your elevated heart rate is measured to indicate valve problems. This may be performed in combination with an echocardiogram or angiogram. Echocardiogram: Uses sound waves that study the pumping action of your heart to evaluate how well your blood is flowing and detect valve issues. CT Angiogram: Uses X-rays to show an image of the heart and blood vessels, which can help your doctor locate valve problems. Effective treatment depends on which valve is damaged and what the issue is. Protecting the heart from further damage is always an important consideration. Surgery is sometimes necessary to restore heart function and improve quality of life. Valve repair surgery works to correct the damaged valves, and is less invasive than valve replacement. In valve replacement surgery, the faulty heart valve is replaced with a valve from another human or animal heart, or a mechanical valve device may be used. The Valve Clinic offers the TAVR procedure, an innovative and effective procedure with many benefits for heart patients with critical aortic stenosis seeking an aortic valve replacement. The TAVR procedure enables the placement of a new aortic valve into the heart via a catheter that is inserted through an incision in the groin area and guided up to the heart through the circulatory system. With an average hospital stay of two to three days, this new treatment method can offer a much shorter recovery time—one to two weeks, versus six to eight weeks with the traditional sternotomy. The Valve Clinic also offers minimally invasive mitral valve repair for patients with mitral regurgitation. Nearly all mitral valve repairs can be performed through a 2- to 3-inch incision in the chest. Compared to valve replacement, mitral valve repair provides many advantages including a higher, long-term survival rate, better preservation of heart functions, lower risk of complications and usually eliminates the need for long-term use of anticoagulants. Other procedures the Valve Clinic offers include the percutaneous valve repair procedure, aortic valve repair, open sternotomy and other minimally invasive valve procedures. Recovery time after heart valve surgery is typically four to eight weeks. During this time, patients will gradually regain energy and resume normal activities, often with the help of cardiac rehabilitation. After successful valve repair or replacement surgery, many patients can discontinue medication. Regular follow-ups with a heart care specialist are necessary to ensure continued heart health. Weight control, good nutrition and an active lifestyle that supports good heart health are vital.